Grilled Fruit on a Stick! Kick up your summer grilling with some out-of-the-ordinary grill items – seasonal fruit. The possibilities are endless, but do keep in mind the fruit’s texture. While peaches and mangoes sound fresh and delicious, we thought they might get too soft on our indoor grill. Instead, we used chunks of watermelon, pineapple and cantaloupe since they’re all fairly firm. If you’re using wooden skewers, be sure to soak them in water prior to grilling so that they don’t catch on fire. (Grilled is good, burned to a crisp is bad!) Grill the fruit a few minutes on each side according to your taste and then enjoy them as a snack or as part of a meal. We dipped our finished kebabs in low fat vanilla yogurt, but there are certainly numerous other dip or sauce options. We’d love to hear about your grilled fruit creations. 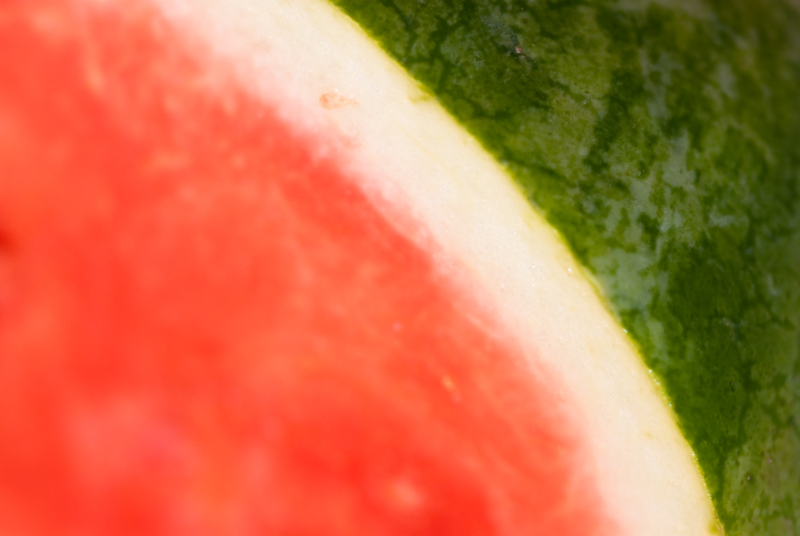 Colorful summer fruits such as watermelon and cantaloupe are both sources of Vitamins A and C, as well as potassium and Vitamin B6. Cantaloupe is also a good source of folate and fiber. Colorful fruits and vegetables indicate a nutrient rich choice. How Stacey Got the Shot: Sam and Stacey got some beautiful shots of the skewers, but they were gobbled up by a computer glitch! (Just another reason why Stacey prefers shooting film.) Fortunately, some of the watermelon photos survived, and this one was taken in the kitchen at ISO 800 with a bounced flash, f/4.5, 1/50 second.